Every year, climbers aspire to tackle the highest mountain on Earth. Some spend their life savings, some spend years training, while others have strained relationships with loved ones in their hopes of reaching the top. But they all have one sacrifice in common: their lives. When we think of extreme sports, Mount Everest is always that distant, yet achievable, summit that comes to mind. This past week, the grim reality of this journey to the highest point was once again brought to light when 4 lives were lost in four days. Phurba Sherpa, 25, crew member from an expedition, fell to his death when attempting to fix a route near the summit. Eric Arnold, 36, climber from Netherlands, died in his sleep after successfully summiting from a suspected heart attack. Maria Strydom, 34, climber from Australia, died of altitude sickness at Camp IV before reaching the summit. Subash Paul, 44, died at Base Camp II from altitude sickness. This marks the first fatalities of the 2016, climbing season, according to CNN. From April to May, climbing enthusiasts from all over the world come to Nepal to try and reach the most sought after peak. This is because less wind and avalanches occur during this time. April was the first month Everest opened to climbers since the 2015 devastating earthquake that hit Nepal, causing a deadly avalanche that killed 16 Sherpas in one day. Since 1953, when Edmund Hillary and Tenzing Norgay made the first official ascent to Mount Everest, more than 200 people have died while attempting the climb. Exposure is the most dangerous part about Mount Everest, or Chomolungma, the Tibetan name meaning, "Mother goddess of the Earth. On average, Temperatures range from -31 to -4 Fahrenheit. In order to reach the summit, climbers have to endure 3 months of an acclimatization period because of the depletion of oxygen. There are 5 camps along the way to the top. During this time, they'll travel back and forth between them so that they're bodies can adjust to the oxygen levels. This also helps to prevent altitude sickness, which can lead to the swelling of the brain. Camp I - Base Camp - 17,700 ft. This is known as home base. Medical teams who accompany expeditions stay here for the duration of the time. This is where the bonding happens between teammates and other countries’ expeditions. The feeling of safety slips away. This is a vast, flat-area of snow, filled with the noise of crashing avalanches in deep crevasses. However, the first sight of Everest can be seen from here. Hope and determination start to cloud the mind. Camp III - 21,000 ft.
Serenity seeps in when reaching this rocky area. It's located at the foot of the Lhotse Wall where stunning views can be seen. This is the last camp that meals can be prepared. From here, it's all instant food. This is the Lhotse Wall, one of the most dangerous places to climb. The wall is 4000 ft. high and sheer ice. Lhotse Face can become a traffic jam with climbers and Sherpa’s coming and going from Camp III. This can become difficult for climbers because it forces them to have to unclip their carabineers and swing around another climber if the same rope is being used. Technical skill is crucial. Also known as the Death Zone. This is where time is critical. After 48 hours, death is a very real possibly because of the exposure and loss of oxygen. This is where journeys will come to an end, not only for those who will lose their lives from extreme conditions, but for those who will have to unfortunately turn back before reaching the summit due to bad timing. 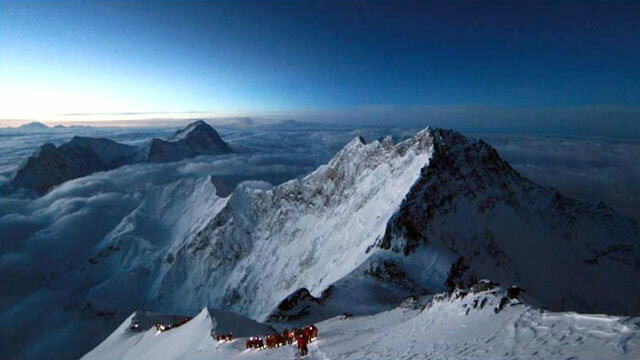 While stories of death and danger swirl over this magnificent peak, climbers still line-up to have a chance to leave their personal item on the summit of dreams. 400 people have attempted in 2016, alone. But dreams come with a price tag. It can cost anywhere from $30,000 – $80,000 for a standard climb. Basically, you can choose between a car and Mount Everest. What’s it gonna be? So why do so many people continue to risk their lives in order to reach the most remote place on Earth? As a climber myself (no I’m not quite Everest ready yet) I can say that it’s solely a passion. A passion not only for that wooden sign that let’s you know that your summit attempt is complete, but for the journey. A journey that helps you see who you are and what you’re capable of.